The Missouri Breaks, Reds, Heartburn, Hoffa, and The Pledge. There are others, of course. He’s funny in a cameo role in Broadcast News. 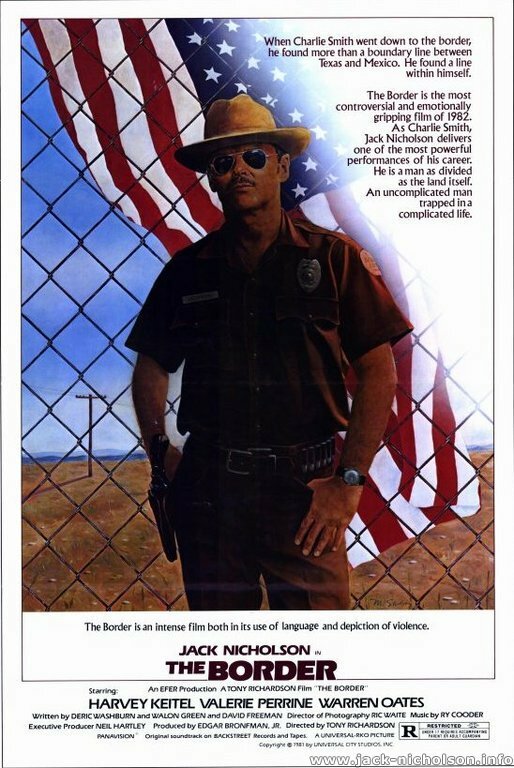 But one of my favorite Nicholson movies is The Border. He’s coiled but not a ham. It’s a wonderful performance. Put it on your Netflix queue. I thought he was great in About Schmidt, not "Jack" at all. Oh, forgot Warren Oates was in that one. HE'S someone who needs his own Banter post! Absolutely - really nice work in that one. That scene at the end, wow. Hell yes! Warren Oates is the man! I'd add KING OF MARVING GARDENS to the list. He's great in WOLF, but the movie gets goofy towards the end. However, the first half is really strong social satire and Jack is fantastic and not in an obvious way. I recall his work in IRONWEED as strong, too. BLOOD & WINE didn't totally work for me, but the scenes with Jack and Michael Caine are gold. I LOVED Anger Management. Some of the scenes in that are side-splitting hilarious. Plus I can watch with my daughter and listen to her laugh. Yeah, we need to address Warren Oates.